Dr. Vithalrao Vikhe Patil the great soul departed, but left behind glowing light and energy, with endless spirit and tremendous potential of development in his son Shri Balasaheb Vikhe Patil, who broadened the base of Economic Revolution. Dr. E.V.alias Balasaheb Vikhe Patil, worthy son of Late Dr.Vithalrao Vikhe Patil, a leader of reckoning in Maharashtra State, Member of Parliament for over two decades took upon himself the arduous task of translating the dreams of his father into concrete realities by meticulous, punctilious planning and by offering dynamic and pragmatic leadership to the Society. The mission of Pravara Medical Trust established in 1972 by Dr. Vithalrao Vikhe Patil, was further strengthened by Dr. E.V.alias Balasaheb Vikhe Patil by establishment of "Pravara Institute of Medical Sciences (Deemed University) by Provision of state of the art Medical education to the people of this remote rural area, was added upon to the comprehensive quality health care model. SOCIAL TRANSFORMATION THROUGH EDUCATION: With this realisation, he adopted a strategy to raise awareness amongst the small peasants and the rural poor, through spread of technical and non-technical education. The spread of 'Education Revolution' with full initial financial and infrastructural support from the Pravara Sugar Factory thus "took off", giving birth to several educational institutions of repute. The vast spread of network of educational institutions, which today are seen, as an 'excellent example', of imparting education in rural areas was not built in a day. This has been built, brick by brick, on the basis of realisation of acute need for education, in remote parts of the rural areas. The seed laid by the Dr.Vithalrao Vikhe Patil blossomed into a sylvan symphony with a large chain of educational institutions. Pravara Medical Trust , Pravra Rural Education Society, Dr. Vithalrao Vikhe Patil Foundation , Pravara Institute of Research & Education In Natural and Social Sciences are the educational institutions of eminence,fully well equipped, with modern infrastructural facilities, supported by well qualified and competent faculty. Mention must be made that all institutions are duly recognised by the concerned statutory bodies of State and Central Governments. Such institutions also provide opportunities to those, who otherwise can't afford higher education in big cities, due to higher cost of living. Shri. Eknathrao alias Balasaheb Vikhe Patil, is leader in his own right who set Paradigms in the rural development in the contemporary Maharashtra. 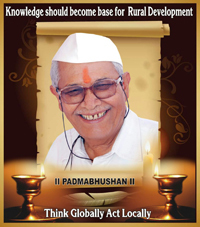 His involvement in every sphere of rural upliftment serves as a torch to understand and proceed in the right direction. As late Pandit Jawarharlal Nehru rightly pointed out that “people should come here (Pravaranagar) and sees how real co-operative is organized and run and former President of India Dr.Kalam said that, “Loni Integrated rural development model” is an ideal model for government India’s PURA programme. Mr. Balasaheb Vikhe Patil has unique temperament of a absorbing the vitals in the environment around as use for the benefits of masses. He has strived hard for years and set an example in every field he ventured and like Gandhiji, he tried to wipe off the tears of deprived ones. In the areas where no common man would think to handle problems, he would take up the challenges so that poorest of poor is benefited. Pravara model which is acclaimed by one and all is a great visualization of Shri Balasaheb Vikhe Patil, of people centric, holistic, multicultural and integrated model of rural development of towards achieving the goals with maximum community participation and minimum external support and interventions. As a human being he has charismatic personality with a sterling quality of making friends, a person approachable for the cause. As he is described by the people of his midas touch. His Multifarious activities are brief as follows. Versatile, accomplished bureaucrat and architect of social reforms, having steered key functions in social work, rural development, education, agriculture, health & hygiene, education and co operation in the country. Noted agriculturist and social worker, with a meritorious record of achievements in incubating and implementing reforms in key sectors of the Indian economy. Architect of reforms in intergrated rural development, rural industries, social reforms, agriculture, irrigation, cooperative movement and education. Pioneer of “Pravara Pattern”, in village development, thereby facilitating inhabitants with educational, technological, socio-economic, health and other facilities. Path-breaking contribution to the field of Rural & Professional education, health Rural communication in agriculture with reference to globalization & modernization in framing rural economy. Contributed significantly as a Member of Parliament for eight terms-as Minister of state for Finance and as Cabinet Minister for Heavy Industries. Served as Chairman on several key committees of parliament representing key sectors and instrumental in introducing significant Parliamentary bills on agriculture, labour, finance, cooperation, Defence etc. Represented on several Boards of high acclaim in key positions like President, Vice President, Founder and more. Introduced a plethora of educational opportunities to the villagers, women, landless laborers and socially backward classes. Launched several education institutions offering primary, secondary and higher education, mainly in the rural areas of the state. Provided amenities for technical, medical and vocational education for rural industrial development & self employment and health awareness. Generated employment opportunities to 2750 teachers and non-teachers, with the enrollment of over 40000 students for different courses. Enabled over 5000 students to avail an opportunity to secure good academic qualification through novel educational schemes. Accredited for launch of Pravara Public School- rural India’s first Public School housing over 1375 students with membership of Indian Public School Conference, New Delhi. Reforms in Cooperation of Rural Development. Propagated the spirit of self help and mutual help which pervaded every area of development activities, thereby helping farmers of Maharashtra. Addressed the problems of unemployment, poverty, ignorance and illiteracy in the new global environment. Promoted several cooperative sugar factories in different areas of Maharashtra and was instrumental in the launch of various cooperative institutions like agricultural credit, agricultural marketing, agro-processing, rural banking etc. Partook in international Sugar Technologist’s Conference at Brazil, Cuba and Havana, thereby exposing farmers to new techniques of sugarcane production. Undertook village development, illiteracy eradication program and facilities for health. Introduced key agro-processing and agriculture marketing initiatives through cooperative. Impetus provided to rural development was recognized by the Indian Council of Agricultural Research (ICAR), New Delhi, resulting in the sanction of Krishi Vigyan Kendra (KVK) during 1992. Spearcheaded a technological revolution in the KVK, benefiting over 1000000 small and marginal farmers in Ahmednagar District and also initiated community radio project like facilities of video conferencing. Promoted integrated rural development through the medium of Information Technology, The Pravara Pragati IT network, a key initiative in this direction, connected 12 Pravara institutions with the rural community in 20 villages, encompassing 85000 rural families. The Project was the first successful model providing connectivity through VSAT Technology, implementing sophisticated technologies like video conferencing in villages. Propelled technological growth in Indian agriculture through expediting the modernization process with technological inputs of training programmers. Achieved 21% increase during the last 30 years in the use of tractors, 52% oil engines and 52% in Dunlop carts. As Minister of State for Finance in the Union Government, kickstarted the process of strengthening insurance for agriculture, small farmers and farm workers. Launched Pravara Cooperative Bank under the system of urban banks, in 1975, with a meager share capital of Rs.2 lakhs deposit of Only Rs. 5000/-and 400 members. The has now been identified as Scheduled Bank by the RBI from 2003. At present share capital has grown to Rs. 299 lacks and the deposit amounts to about Rs.24716 laks. The Bank financially assisted education for marginal income group, for housing to schedule caste and tribe, low income group people, to promote rural development and cooperation, to promote village industries, motivate young technically qualified persons to start their own industries in the area and to promote dairy development. Established Pravara Rural Hospital in 1972, which has emerged as an ultra modern, 750 bedded well equipped hospitals with expert doctors. The hospital undertakes comprehensive community health care of the villages and provides health services at affordable rates, now the help of surperspeciality. The institution has been serving the underserved tribal and hilly people of 500 villages at the doorsteps through various innovatives and empowerment of Female Health Volunteers. Introduced Pravara Rural Medical College- one of the few colleges in the country conducting community oriented medical education program having international collaborations for exchange of staff, students and collaborative research work in Maastricht, the Netherland University of Limburg, the University of Pecs, Hungary and University of Linkoping, Sweden. Now it has been recognized as a Deemed University, which houses superspeciality training programmes. *Priority for enrolment given to the student from local area & rural areas. Steered the socio economic development in Ahmednagar District. Appended Pravara Institute of Research and Education in Natural and Social Sciences (PIRENS) an NGO to the portfolio of institutions, with an impetus to economic alleviation programs, thereby generating employment for rural masses. The institution has been doing commendable work for the lot of patients through its vast network of health camps, helping couple of lacks beneficiaries in the process. Architect of the launch of the first I.T.I in Maharashtra for Women and the first Polytechnic for girls for acquiring technical skills. Undertook social upliftment of women through the launch of PIRENS programmes. Piloted key initiatives to address water scarcity through the launch of an NGO, “Maharashtra Pani Parishad”. Which suggested various programmes harvesting of water with various means. Promoted Pravara Sports complex, giving impetus to various sports, organizing tournaments and competitions at national level also providing cultural inputs with exposure. Member of Lok Sabha, Kopargaon Parliamentary Constituency, 1971-1991. Member of Lok Sabha, Ahmednagar Parliamentary Constituency, 1998-1999. Member of Lok Sabha, Kopargaon Parliamentary Constituency, 1999-2004. Minister of State for Finance (Expenditure, Banking & Insurance) Govt. of India, New Delhi-1999-2002. Minister of Industry (Heavy Industries & Public Enterprises) Govt. of India, New Delhi-2002-2003. Member of 14th Lok Sabha, Kopargaon Parliamentary Constituency, May,2004. President, Maharashtra Rajya Sahakari Karkhana Sangh Ltd., Mumbai, 1981-1984. President , Maharashtra State Distilleries Assocation, 1977-1982. President, Friends of Soviet Union (Maharashtra State) Since1980. President, Maharashtra Granthpal Sangh Since 1982. President, Maharashtra Samajawadi Congress, 1977-1979. President, Founder Executive President of Maharashtra Pani Parishand, Loni, Dist.Ahmednagar (M.S.) from 1995. President, India Water Partnership, New Delhi from 29th November 2003. Vice President, Friends of Soviet Union (Maharashtra State), 1975-1980. Vice President, Maharashtra Pradesh Congress Committee, 1980-1984. Vice President, Ahmednagar Zilha Parishad, 1962-1971. Vice President, Maharashtra Rajya Sahakari Sakhar Karkhana Sangh Ltd., Bombay, 1980-1981. Chairman, Committee on Agriculture Lok Sabha 1989 & 1991. Chairman, State Level accounts committee, Maharashtra State in 1988. Chairman, State Level Committee appointed by Government of Maharashtra to suggest minimum wages for Agricultural labours 1987-1988. Chairman, Education and Public Works Committee Ahmednagar Zilha Parishad, 1962-1967. Chairman, Agricultural Committee & Public Works Committee , Ahmednagar Zilha Parishad, 1967-1971. Chairman, Pravara Sahakari Sakhar Karkhana Ltd., Pravaranagar, 1966-1977, 1978-1981 & 1982-1987. Chairman, Study Team appointed by Govt.of Maharashtra,to study sugarcane yield and recovery in Maharashtra State. Chairman, Committee appointed by State Government to suggest a chapter for the co-operative Societies Act on Co-operative sugar factories. Chairman, Pravara Rural Education Society, since 1981. Chairman Standing Committee on Defence, 5 Aug.2004. Chairman of the Vigilance & Monitoring Committee for the district of Ahmednagar, Dec.2004. Treasurer, Maharashtra Pradesh Ceongress Committee (I) 1985-1989. Secretary, Ahmednagar district Congress Committee, 1968-1971. Founder, Parner, Co.Operative Sugar Factory, Parner, Dist. Ahmednagar. Founder, Jagdamba, Co.Operative Sugar Factory,Karjat, Dist. Ahmednagar. Founder, Vridheshwar Co.Operative Sugar Factory,Pathardi, Dist.Ahmednagar. Founder, Pravara Sahakari Bank, Ltd. Loni. Founder Trustee, Pravara Institute of Research and Education in Natural and Social Sciences, Pravaranagar. Founder Trustee, Pravara Rural Medical Trust, Loni. Founder Trustee, Pravara Institute of Technology & Engineering, Pravaranagar. Founder Trustee, Dr.Vikhe Patil Patil Foundation, Pune. Founder Trustee, Pravara Co.Operative Dairy Society for 45 Villages. Founder Trustee, Pandit Jawaharlal Nehru Academy for performing Arts, Pravaranagar. Founder Trustee, Dr.Vikhe Patil Foundation, Ahmednagar. Founder Trustee, Dr.Vikhe Patil Foundation, Nashik Centre.. Founder Trustee, Shirdi Sai Rural Institute, Rahata, since 1997. Chancellor, Pravara Institute of Medical Sciences (Deemed University) Loni, Dist.Ahmednagar. (MS) since 2004. Director, Maharashtra State Farming Corporation Ltd. 1964-1977. Director, Maharashtra Rajya Sahakari Sakhar Karkhana Sangh Ltd.Mumbai 1966-1988. Director, National Federation of Co.Op.Sugar Factories Ltd.New Delhi, 1976-1990 & Member of Executive Committee, 1982-1986. Director, Indian Sugar Export Corporation, 1979-1988. Director, Pravara Sahakari Bank Ltd.Loni, 1975-1996. Director, Dr.Vithalrao Vikhe Patil Sahakari Sakhar Karkhana Ltd., Pravaranagar 1966-1997. Director, Associates a large number of trusts rendering services to community in different areas. Member, Governing Council & Executive Committee, Indian Council of Agricultural Research, New Delhi. Member, National Council of Rural Development, Hyderabad. Member, Managing Committee, All India Distilleries Association, New Delhi, 1978-1989. Member, Deccan Sugar technologists Association, Pune Since 1976 to till date. Member, Standing Committee on communication, Lok Sabh, New Delhi, 1998. Trustee, Dr. Vikhe Patil Foundation, Pune. Annasaheb Chirmule Award in 2001. Rashtriya Bandhuta Purskar by Rashtriya Bhandhuta Sahitya Parishad & Bandhuta Pratistan, Pune at a function held at Kalidas Mandir, Nashik on 22.2 2004. Saraswati Puraskar by Kailas Math, Nashik on Feb.2006. Sahakar Maharshi Ganpatrao Sathe First State Level Life Time Achievement Award on 11.3.2006. Rashtra Seva Puraskar by Dr.Manibhai Desai Pratistan, Pune on 27th April, 2006. Life Time Achievement Award by University of Pune on 10.2.2008. Awarded by Mahatma Phule Agricultural University, Rahuri on the occasion of Cotton Day on 24.9.2006. Awarded by people of Sangamner taluka on the occasion of Amrit Mahostav on 9.11.2006. Vikas Bhushan Puraskar by Kakasaheb Mhaske Pratistan, Ahmednagar on 5.5.2007. The Jeevan Sadhana Gaurav Award from Pune University for lifetime achievement in the field of education and rural development in 2007. Most prestigious civilian awards, the Padma Bhushan award 2010, for distinguished service of high order in Social work.